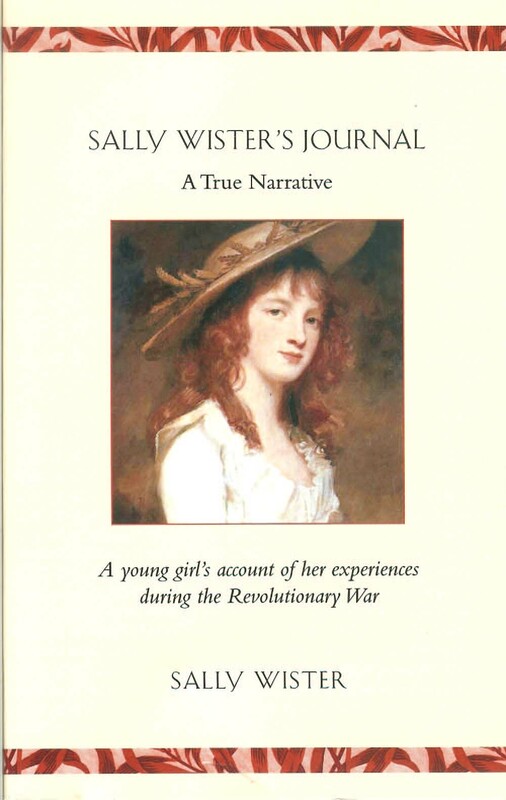 One little gem I’ve come across is the book, Sally Wister’s Journal: A True Narrative, which describes “a Quaker maiden’s experiences with officers of the Continental Army, 1777-1778.” This 1995 paperback offered by Applewood Books of Bedford, MA is a reprint of the original 1902 publication. You can find it (the 1995 publication) on Amazon. It’s a very quick read–just 62 pages. The Foulke family website offers the 1902 publication’s introduction by Albert Cooke Myers which is absent from the 1995 reprint. Mr. Myers’ lengthy introduction really needs to be read in tandem with the Journal as it contains important information about the Wister family and the historical context. However, I highly recommend viewing the original 1902 book. You can download it for free from Google Books. It contains a great deal of rich detail including Mr. Myers’ excellent introduction. I don’t think you’ll be disappointed. Sally was just sixteen when she wrote this journal during a year’s absence from her home in Philadelphia. She and her family left the city once it was clear to them that the British would soon be arriving to occupy the city. They stayed in the countryside to the northwest of the Philadelphia in one half of a mansion owned by the Foulke family with whom they were extremely close. She wrote the journal as a way of keeping up correspondence with a dear friend in Philadelphia with the thought that the friend would get to read the journal once Sally got back to the city. In reality, the friend never actually knew of the journal’s existence until after Sally’s death in 1804. The journal is full of details about her daily activities, thoughts, and flirtations. She describes all the comings and goings of the American army’s generals, colonels, lieutenants and other important military figures, as well as Sally’s and her family’s trepidation at news reports of troops on the move or upon hearing sudden strange sounds. At some points the mansion was used for extended stays by various officers. Sally’s descriptions of them are often quite amusing–she develops an obvious crush on a major who enters her life on several occasions and seems to reciprocate her feelings. I won’t spoil anything for you by telling you what happened to each of them, detail contained in Mr. Myers’ introductory information. 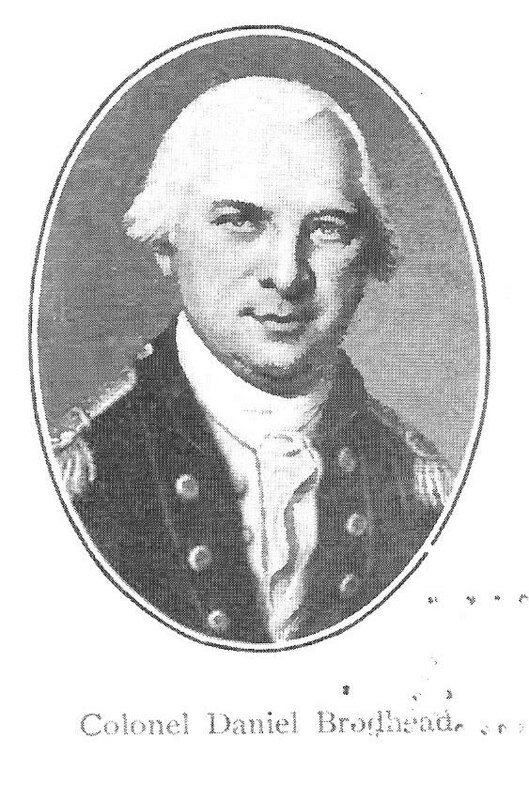 This is our fifth-great-grandfather Garret Brodhead’s brother, Daniel (1736-1809). You would not necessarily know this straight away unless you read the 1902 book which contains additional biographical detail. Sally, of course has misspelled his last name–you know how it is–someone’s always adding that extra “a.” Though later a brigadier general, Daniel was a colonel when he led his troops in 1777 during the defense of Philadelphia and during his winter with Gen. Washington at Valley Forge (1777-1778). Valley Forge by the way is very close to where the Wisters were staying. The description of the miniature states that “it was in the possession of Mrs. Johnson of Williamsport, Pennsylvania, widow of the late Henry Johnson, Esq., of Muncy, PA, to whom it descen ded through his mother, Mrs. Rebecca J. Johnson, granddaughter of General Brodhead. In his will dated August 8, 1809, probated in Wayne Co., Pennsylvania, November 25, 1809, General Brodhead thus disposed of his portraits: “I give to my Granddaughter Rebecca Johnson (late Rebecca Heiner) my miniature picture set in gold” and “to my Granddaughter Catharine Brodhead my small portrait picture.” The miniature, in size 1 5/8 x 1 1/4 inches, is painted on ivory and set in a gold frame. The eyes are blue, and the hair white. The uniform is blue with scarlet facings. The waistcoat and stock are white.